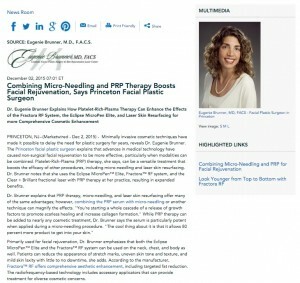 Dr. Eugenie Brunner explains how Platelet-Rich-Plasma therapy can enhance the effects of the Fractora™ RF system, the Eclipse MicroPen® Elite, and laser skin resurfacing for more comprehensive cosmetic enhancement. Princeton, NJ — Minimally invasive cosmetic techniques have made it possible to delay the need for plastic surgery for years, reveals Dr. Eugenie Brunner. The Princeton facial plastic surgeon explains that advances in medical technology have caused non-surgical facial rejuvenation to be more effective, particularly when modalities can be combined. Platelet-Rich-Plasma (PRP) therapy, she says, can be a versatile treatment that boosts the efficacy of other procedures, including micro-needling and laser skin resurfacing. Dr. Brunner notes that she uses the Eclipse MicroPen™ Elite, Fractora™ RF system, and the Clear + Brilliant fractional laser with PRP therapy at her practice, resulting in expanded benefits. Primarily used for facial rejuvenation, Dr. Brunner emphasizes that both the Eclipse MicroPen™ Elite and the Fractora™ RF system can be used on the neck, chest, and body as well. Patients can reduce the appearance of stretch marks, uneven skin tone and texture, and mild skin laxity with little to no downtime, she adds. According to the manufacturer, Fractora™ RF offers comprehensive aesthetic enhancement, including targeted fat reduction. The radiofrequency-based technology includes accessory applicators that can provide treatment for diverse cosmetic concerns. Dr. Brunner, a double board certified facial plastic surgeon, leads a facial plastic surgery and laser skin rejuvenation practice in Princeton, New Jersey. She is a Fellow of the American College of Surgeons, a Fellow of the American Academy of Cosmetic Surgery, and a Fellow of the American Academy of Facial Plastic and Reconstructive Surgery. After graduating with honors from the Robert Wood Johnson Medical School—The University of Medicine and Dentistry of New Jersey, she completed additional training at New York University Medical Center and the University of Toronto. She is the recipient of numerous awards and is an advocate of continuing medical education. Dr. Brunner is available for interview upon request.